“We are thrilled to be part of The Nilson Report for 2016 and look forward to climbing the ranks," states Phillip Heath, President of APS. 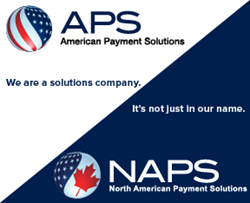 American Payment Solutions (APS) is proud to announce that North American Payment Solutions (NAPS), the global entity of APS, is now ranked the 6th fastest growing acquirer in the United States and the largest credit card processing acquirer based out of Arizona in the recently published “Top Acquirers Ranked by Purchase Volume in 2016 (Bil. )” by The Nilson Report, a well-respected industry publication. American Payment Solutions is one of the nation’s leading credit card processing companies, providing 24/7 award-winning customer support, Guaranteed Rates, and up-to-date technology to thousands of merchants. NAPS was ranked the 6th fastest growing acquirer in the recently published “Top Acquirers Ranked by Purchase Volume in 2016 (Bil. )” by The Nilson Report, a well-respected industry publication. North American Payment Solutions is the largest Acquirer in Arizona, as listed by said report, with headquarters in Mesa, AZ, and several field offices throughout the United States and Canada. For more information, please visit http://www.apsmerchants.com.